I’ve long been a fan of the Colt New Service revolver for a number of reasons. Not only were they finely made firearms, as most Colt’s always have been, they have a classic, old time look and feel that’s hard to beat. 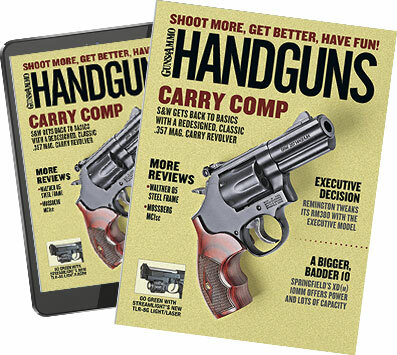 The New Service was a heavy framed revolver built for the big bore cartridges of its day, including the .45 Colt, .476 Eley, .44-40 and .38 Special, among others. This big-boned handgun was used by law enforcement and military personnel to great extent in the first half of the 20th Century, and rightly so. It not only was built for heavy, hard hitting calibers, it was made to last. Over 150,000 Colt New Service revolvers were purchased by the U.S. Military for use in World War I. These wartime revolvers were all chambered in .45 ACP. The revolver was well- liked by the men who carried them. In the years between the Great Wars, officials of the United States Border Patrol became fond of the New Service – one of them was the famous lawman, military veteran and outdoor writer, Charles Askins. El Paso, Texas has traditionally been a pretty rough place, and Askins found himself a number of scrapes while working there as a Border Patrol Agent. He had many run-ins with smugglers, many of whom were heavily armed. During his Border Patrol days, Askins favored the New Service chambered in .44-40. While I might have preferred the same gun chambered in .45 Long Colt, Askins put the .44 to good use, dispatching a number of hard-cases with the gun. Askins’ preference for the big Colt in .44-40 has always prompted me to want one. Not long ago I was attending the Tucson gun show and ran across a real beauty – a four inch New Service in .44-40. The gun was in excellent condition, with about 90% of the original blue. Of course, I wasn’t leaving there without it. Using Black Hills 200 grain RNFP ammunition, my New Service is one of the most fun and accurate revolvers I’ve got. I sure believe the New Service is worthy of re-introduction by Colt – how about you?